With the changes in weather that come along with the arrival of winter, the likelihood of catching a cold or the flu increases. While this may not be of much concern to adults, new parents must be concerned about protecting their baby from these types of illnesses. One of the main reasons it can be tough to combat cold and flu is because you can’t see them. As a result, you never know if something you touch at a store may have one the strands of flu virus or when you shake a person’s hand if they have passed you cold germs. However, you don’t have to feel helpless in the fight. There are things you can do to help protect your newborn. 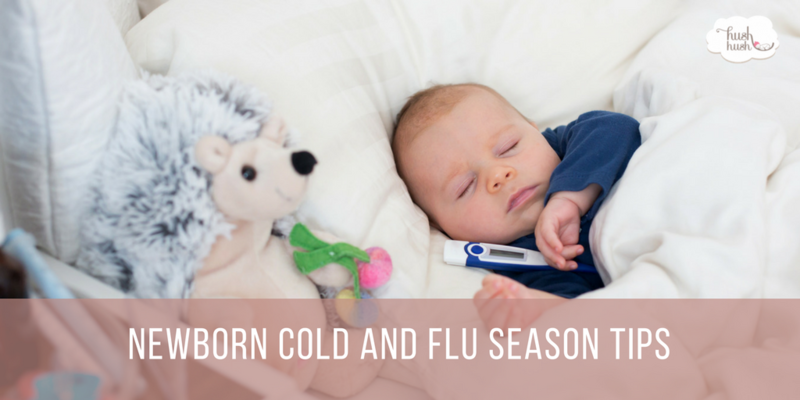 Below you will find helpful tips for avoiding a newborn cold or flu this season. While it may seem like common sense, you might be surprised at the number of people who choose not to get the flu shot. According to the Centers for Disease Control and Prevention (CDC), less than 50% of people from age six months to sixty-four received an influenza vaccination within the last twelve months. When it comes to your baby, it is simply not worth the risk so be sure that anyone that will be caring for your child has their flu shot. While it does not directly affect newborn colds or contraction of the flu, there are a variety of other vaccinations that are needed as well. Another practical method to control the spread of germs and protect your child from a newborn cold is to make sure that you are regularly washing your hands. Hand washing is especially helpful when you are out of the house. Be sure to use soap and warm water when washing your hands to maximize effectiveness. You can also make use of hand sanitizer while you are out and about to kill many types of germs. It is also advisable to make sure that guests thoroughly wash their hands when they enter the house and certainly before they handle your child. While hand sanitizing can be effective in preventing a newborn cold, all strands of flu are not created equal and many of them are not killed by alcohol (the main germ fighter in hand sanitizers). Therefore, if someone gets the flu or a stomach bug, make sure that you sanitize all hard and bleachable surfaces with a bleach and water solution. The CDC website lists proportions for being able to disinfect several types of materials and surfaces. Remember, viruses can live on surfaces long after the virus has passed through the person that had it so it is imperative that you sanitize everything.